When it comes to the best places to visit in Amritsar, the obvious and first choice is definitely the Golden Temple. But when you are planning to spend your holiday, exploring the lesser known attractions of a historical city like Amritsar is equally important. Let’s take a look at some of the amazing places to visit in this holy city. 1. Jallianwala Bagh – Witness to one of the brutal mass massacre of herculean level, the Jallianwala Bagh will always be remembered for the its blood soaked soil. The incident of 13th April, 1919, which saw the British troop firing on a crowd of unarmed populace and leading to more than 400 deaths and 1100 other casualties, is a dark scar in the Indian fight for Independence. The incident also marked a turning point in India’s contemporary history, with damaging the Indo-British ties and led Mahatma Gandhi to initiate the cause of separate Indian nationalism with full force. Today, you can see the bullet marks and feel the rush flow through your veins as you walk within the premise of the park. 2. 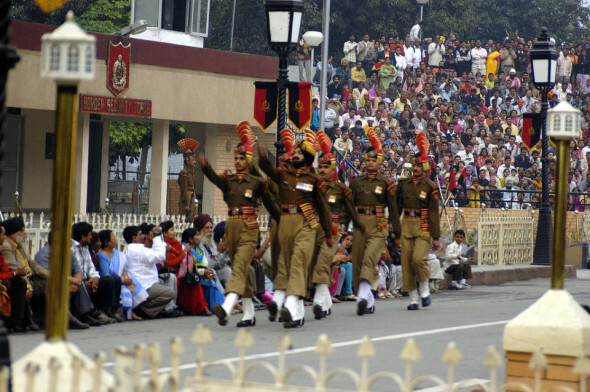 Wagah Border – Located about 30km from the city center and on the Grand Trunk road, the Wagah Border attracts a lot of tourists. Famous for its opening and closing of the gates, which has become a more of ceremony, it is a must watch. 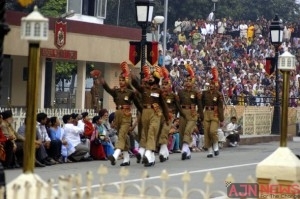 The marrying beats of the drums and trumpets with the shoulder high march of tall soldiers is a sight worth watching. As the Flag Code of India mandates that the national flag shall be kept high on the mast only from sunrise till sunset, the best way to capture the excitement is from early in morning when the crowd is also comparatively lesser. The sheer energy of the place will fill you with a patriotic high. 3. Ram Tirth – Considered to be the place where the great sage Valmiki wrote the epic Ramayana, legend also has it that Ram Tirth is the birthplace of Lord Ram and Sita’s sons, Luv and Kush, and that this sacred place was dug up by Hanuman. You’ll be amazed to see that the hut where Valmiki lived still stands there. 4. Central Sikh Museum – Established in 1958, the Central Sikh Museum exhibits some of the finest paintings of prominent gurus and warriors of the Sikhs, who had a great contribution in growing up the religion. You can find some of the rich collection of coins and ammunitions. If you’re a bookworm then the excellent library in the museum loaded with ancient manuscripts will surely delight you. So, if you’re planning to spend a fun-filled yet enriching holiday this New Year’s, plan a trip to this fascinating city of Amritsar. The city is well connected with other major cities of India and the best way to get there is to take an Amritsar to Chandigarh train, if coming from the national capital.